Just imagine if you never brushed your teeth- I shudder at the thought. Of course, so does your dentist! Our dental health is vital, which is why we brush our teeth, floss (or at least tell our dentist we do) and schedule regular visits and cleanings with our dentist. The same should apply for your pets. Pets are susceptible to pretty much the same dental diseases that we are, from bad breath and cavities to gum disease and tooth loss. Staying on top of dental care for the animals we love is important first and foremost because it helps to keep them free of pain and misery. 1. Periodontal disease is present in nearly four out of five family pets over 3 years old. 2. It costs, on average, three times as much to treat dental disease in a pet as it does for regularly scheduled preventative care. 3. Poor dental health can lead to other problems, due to bacteria being harbored in the mouth. Heart disease and other other organs may be affected by poor oral health. Bad Breath- This is the most common sign, but doesn’t always mean your pet has periodontal disease- but almost all pets with dental disease have bad breath. ‘Doggy Breath’ is normal, but bad breath brought on by bacteria or gingivitis isn’t. Red or Swollen Gums- This is commonly known in both human and veterinary dentistry as Gingivitis. Receding Gums- When the pet’s gums begin to separate from their teeth, it’s a sign of gum disease. If not prevented or stopped, the gum will continue to recede and expose the root of the tooth/teeth. This is painful for your pet. Bleeding gums- Bleeding is never normal and can be a sign of advanced dental disease. Dropping of food while eating- Most pets love to eat. If your pet drops food while eating, or does not seem to be as excited at dinnertime, it could be due to pain brought on by eating or chewing their food. What can I do to prevent this from happening to my pet? You can brush their teeth. If your dogs or cats are already into adulthood, it might be a challenge getting them amenable to a toothbrush, but with perseverance, you may get to the point where you can do a pretty good job. 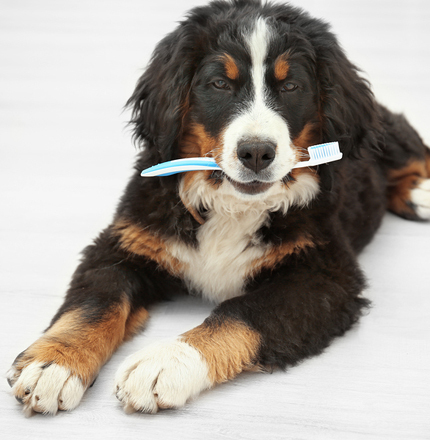 Brushing will be easier if you start it during while the pet is still young. There are also numerous types of chews, treats, food and even water additives that you may consider for your pet that are designed to deter bacteria and slow growth of plaque and tartar. Always speak with your veterinarian about which product may be best for your specific pet’s needs. 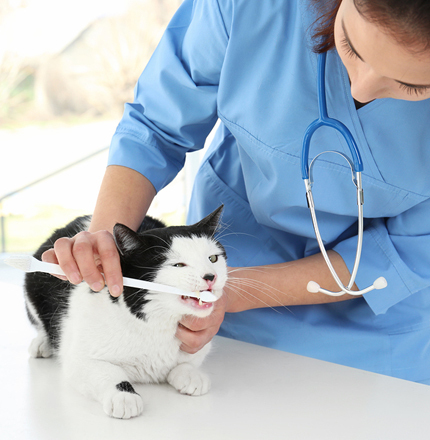 You may not be able to give your pet a first-class teeth cleaning, but your vet can. In addition, we also examine your pet for early signs of dental disease so we can quickly initiate the correct treatment. When we’re done with the exam, we will give your pet a dental grade- numbered 0 through 4. It’s not like bowling- the lower the number here is better. Grade 0- There is no plaque or gingivitis present. We rarely see grade zero pets beyond one year of age. Grade 1- We may see some mild gingivitis and a little plaque. Most everything looks pretty good, and we can keep it at this level (or even reverse this) with the right chews and regular brushing of the teeth. Grade 2- There’s moderate tartar build-up and gingivitis has spread to multiple teeth. We can fix this, but we need to do a proper dental cleaning which includes scaling and polishing. Grade 3- Your pet is most likely in pain. We notice heavy tartar and periodontal disease, and there is a probability of bone loss. Tooth fractures are possible under the calcified tartar. X-rays are probably needed to determine if extractions will be required. Grade 4- We hope we never get here. Tooth loss is likely, whether they fall out on their own, or if we need to extract them. Your pet is definitely in pain. I find that dental disease is the most preventable disease I see every single day. Like many things, it is easy to prevent, but can be expensive to treat. So, let’s work on preventing dental disease- and the best place to start is with an exam and a cleaning. We’ll then set out a plan on how to make sure we keep your pet’s dental grades at a “1” or better- so they’re pain free and can give you kisses with fresh breath!